Germany has installed solar and wind power to such an extent that they should be able to satisfy the power requirement on any day with sufficient sunshine and wind. However, since sun and wind are often lacking, they only manage to produce around 27 percent of the annual power needs. When solar and wind production are at their maximum, this often lead to overproduction and major problems in equalizing production and consumption. To keep the frequency of the electric power within tight limits around 50Hz, it is no longer possible to increase the amount of solar and wind production in Germany, without additional, costly measures. Production is often too high to keep the network frequency stable without disconnecting some solar and wind farms. This leads to major energy losses, forced power exports to neighboring countries and negative electricity prices. In 2017 about half the wind production in Germany was exported. Neighboring countries do not want this often unexpected power, and the German power companies must therefore pay to get rid of it. German customers have to pick up the bill. If solar and wind power plants are disconnected like this, owners are paid as if they produced 90 percent of rated output. The bill is sent to the customers. Germany also have to disconnect large power consumers from time to time. They also want compensation and the bill goes to the customers. Power production from sun and wind is often quite low and sometimes even absent. This might take place over periods from one day to 10 days, especially during the winter months. The conventional power plants (fossil and nuclear) must then step in and deliver according to customer needs, except for the power from hydro and bio power, which are able to deliver about 10 percent of the demand. Alternatively, Germany may import nuclear power from France, oil-fired power from Austria or coal power from Poland. In practice, this means that Germany can never shut down the conventional power plants as planned. These power plants must be ready and able to meet the total power requirements at any time, and without them, a stable network frequency is unobtainable. If the AC frequency is allowed to drift, the risk of extensive blackouts is imminent, as demonstrated by South Australia, also having a lot of solar and wind power. The dream of supplying Germany with mainly green energy from sun and wind turns out to be nothing but a fading illusion. Solar and wind power today covers only 27 percent of electricity consumption and only 5 percent of Germany’s total energy needs. However, the Germans are not yet planning to end this. They want to change the entire energy system and include both electricity, heat and transport sectors in their plans. This will require a dramatic increase in electrical energy and much more renewable energy, primarily wind. 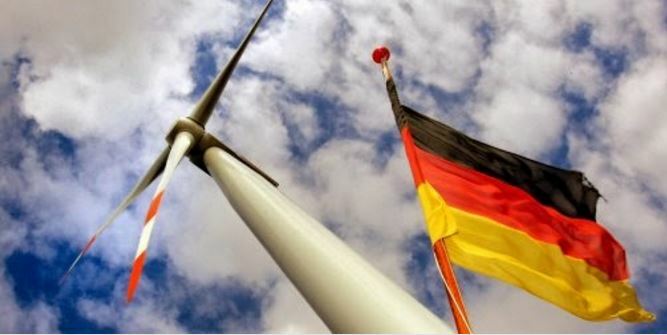 To fulfil the German target of 60 percent of their total energy consumption from renewables by 2050, they must multiply the current power production from solar and wind by a factor of 15. And, in addition, they must equally expand their output from conventional power plants in order to balance the intermittent renewable energy. Germany might import some of this balancing power, but even then the scale of this endeavor is enormous. Construction of solar- and wind farms has already caused massive devastation to German nature. Even today, the northern part of Germany looks like a single big wind farm. Multiplying today’s wind power capacity with a factor 10, implies that a 200-meter-high turbine must be installed every 1.5 km across the country, within cities, on land, on mountains or in water. It is virtually impossible to increase production by a factor of 15 as indicated by the plans. The cost of “Die Energiewende” is enormous, about 200 billion € up to 2015 and with minimal reduction in CO2 emission. CO2 emissions and coal consumption have been stable the last 7 to 10 years. In the absence of a miracle, Germany will not be able to fulfill their self-imposed climate commitments, not by 2020, nor by 2030. What applies to Germany also applies to other countries mainly producing their power in fossil- or nuclear power plants. With a development comparable to that of Germany, such countries will only be able to replace about one quarter of the energy from fossil and nuclear power, because these power plants must remain in operation for the sake of frequency regulation, balance- and back-up power. Back-up power plants will have to run idle during periods of high output of renewable energy, while still consuming fuel almost like during normal operation. They always have to be able to step up to full power because in the next few hours solar or wind power might fail. The prospects for reductions in CO2 emissions are thus nearly non-existent! The more renewables they add to the system, the greater the already known problems (load balancing, backup, high costs, coping with peak demands etc.) become. Update: Curtailment payments to wind power in 2014 amounted to €65m, but rose to €277m in 2015, and rose strongly again to €467m in 2016. For comparison purposes, constraint (curtailment) payments to windpower in the UK totalled £91m and £82m in those years. Meanwhile Poland is planning a new coal mine in Silesia and the Adani project is to proceed in Queensland, with 4 or 5 other (coal mining) projects interested in the new trainline which would make their operation viable. Bulgarian coal miners are protesting about EU plans forcing the mines to shut. And there are rumours that some people in France aren’t too happy either. Back in 1976 I was in the Alternative Energy Business and one day I ran the numbers. Result was Wind and Solar could NEVER provide the energy needed for an Industrialized civilization, NEVER ! There is not enough land, material and wealth available to create a workable system. The world wide Growth in demand would exceed the ability to keep up ! Repair and degradation of the weather exposed parts would create demands would that exceed any ability to keep up such a massive system.. The ONLY Terrestrial based system that can De-carbonize our civilization is Atomic and that was the very first energy generation source that the Ecoloons precluded. These people are not logical if they wish to solve the problem. Then they stopped the further expansion of Hydro, The only other renewable alternative to maintaining the systems functions. Are Ecoloons deliberately ignorant? STUPID, or do they hate people? There is no cure for stupid. They seem to recognize that Electricity is a clean way to transmit and utilize vast amounts of energy but ignorant and opposed to any actual generation facilities. NIMBYs, Not In My Back Yard ! “just get it from somewhere far away, out of my sight, out of mind.” If there is a shortage, shut someone else off, If there are additional costs, someone else must pay for it. Ecoloons are well named. they wrap themselves in “Green” virtue while sowing death and misery on their fellow citizens. They claim to be saving the Environment while destroying it on a grand scale. They are not just Loony, They are criminally Insane, waging war on Humanity to “save” it. We must save ourselves from their “good works” before they destroy everything that still functions. No, REALLY. Not as the silly ‘backup,’ but as an output controller. Renewables should produce to batteries, and grid feed come from said batteries. This would make the grid interface smooth and predictable. Yeah, probably double the cost, but who cares about cost when you are Saving The Planet™? Sorry Gamecock, but you forgot to apply the /sarc tag. No matter how the green ecoloons try to sell it batteries will never be the answer unless the aim is to end up with a polluted wasteland 15 years down the line. And how long do you suppose the batteries will last during a cold, gloomy, windless week in February? You people are reading comprehension challenged. Germany also have to disconnect large power consumers from time to time.